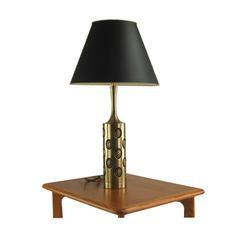 Bronze table lamp with sophisticated abstract embossed circular decorative elements. 27" to top of socket x 5" diam. Condition is excellent / near mint. There are no dents or dings or scrapes or scratches. Lamp is solid and substantial, in good working order. Sophisticated abstract embossed circular decorative elements. The design is "strong and important." The lamp maintains the original hand patination on the brass surface. There is no shade included in this listing.